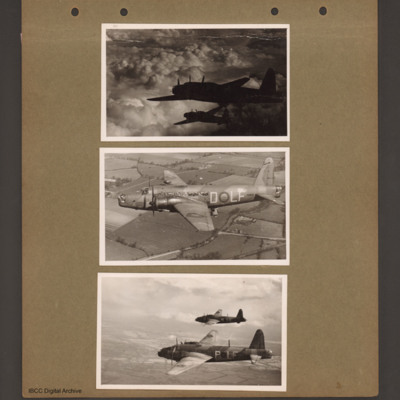 Photograph 1 is a vertical image of bombs dropping from one B-24 onto a second. 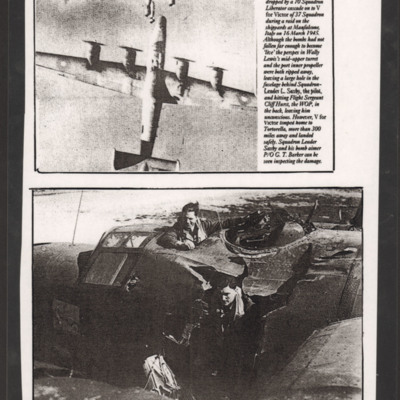 Photograph 2 is the damaged B-24 on the ground showing the damage. Two crew are looking through the damaged areas. Top air-to-air view of two Wellingtons in silhouette one below the other flying right to left. Clouds below. Middle an air-to-air view of a Wellington D-LF N2992 showing ventral dustbin turret, with open countryside below.